The arrival of the newest member of your family is a joy to behold, but there’s a practical side to this life-changing event. Your newborn will need to wear diapers until they’re old enough to potty train. This time period can often span up to three years old. As diapers become a way of life, you also need a quick-and-easy way to dispose of them at any time of the day. The best diaper pail is a great solution to your baby’s needs. Today’s diaper pails aren’t basic containers with lids, however. These diaper pails have numerous features that will enhance the sanitary conditions in the nursery while making garbage chores almost pleasant. The top pick among all of the available pails on the market today is the Step product by Munchkin. Its large, cylindrical size is functional and attractive for any nursery because it’s a basic, white hue. Both boys’ and girls’ rooms will have a diaper pail that’s strong enough to hold more than a dozen diapers while containing the odors tightly inside. Explore all of the features that this product offers your entire household as the new baby takes center stage. If you’re looking for a compact diaper pail, this Munchkin design is not for your needs. It’s actually quite large with a 27-inch height and 12-inch diameter. You can fit newborn to two-year-old diaper sizes into this container. In fact, some consumers report that you can use this for adult diapers too. The diaper pail’s height and diameter makes it a center point in any room, so keep it wiped down as much as possible. With a white exterior and silver accents, you’ll always know when a quick cleanup session is necessary. Your hands are incredibly busy as you change a diaper. At least one hand should be on the child at all times. Because you don’t have a free hand to lift a pail lid, Munchkin designed their container with a pedal system. Step on the sturdy pedal and the lid lifts up with ease. Remove your foot in order to drop the lid back into place. You don’t have to think too much about your diaper-changing routine when a pedal is the only action that you have to consider. As the lid lifts up, you’ll notice a baking soda disc that’s affixed to the inside surface. Replace this disc as necessary, and you’ll always be greeted with a lavender scent. Munchkin partners with Arm & Hammer so that your new diaper pail will immediately come with the lavender baking soda. Ideally, you should only be greeted by a flowery scent each time you add a diaper into the container. There’s some versatility within this diaper pail because it can be used with a variety of bag types. Ideally, you should add the traditional refill rings to the pail that simply snap into place. Alternatively, the “seal and toss” bags are also viable choices. The bags essentially create a chain of diapers that compact within the unit. You’ll know when the diaper pail needs to be emptied because it becomes progressively harder to place more items into the unit. Discover which bags work for your needs and buy them in bulk orders. You’ll need them for at least a few years, and buying in bulk will always save you money. One drawback to this diaper pail is the material construction. It appears to be made out of metal, but it’s actually plastic. This lightweight material is perfect for a durable product that doesn’t succumb to dents. Odors might leak out of assembly points around the unit, however. Consumers need to weigh their options before they choose between this plastic model and a metal alternative. An ingenious feature added to this diaper is the childproof button. You might wonder where this button is hidden. It’s actually on the diaper pail’s top surface when you open the lid. Busy parents might forget to drop the lid back down, or curious children want to lift it themselves. This button is the only way to open. As a result, curious children will only have access to the very top of the diaper pail, which keeps them out of harm’s way. Don’t let the high price of this diaper pail fool you because it’s worth every penny. The Steel model by Ubbi is a deceptively simple design. It has a tall, oval shape that fits between any furniture pieces in the nursery. In fact, some consumers love the look of this diaper pail so much that they plan on repurposing it as a trash can as their children grow older. Get to know this pail’s features, and you’ll be tempted to try it out. 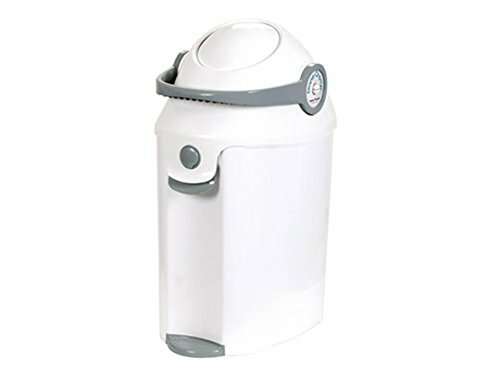 The feature that makes this diaper pail stand out from the others is the metal construction. It’s made entirely out of steel with an attractive, powder coating. Although you might think that steel isn’t necessary for a basic container, it’s perfectly suited to hold those odors. Steel won’t allow fumes to permeate the material or escape the container. You also have rubber seals at all of the opening sections around the steel. Odors will only be noticed when you quickly access the interior during disposal. An alternative to disposable bags is a cloth liner. 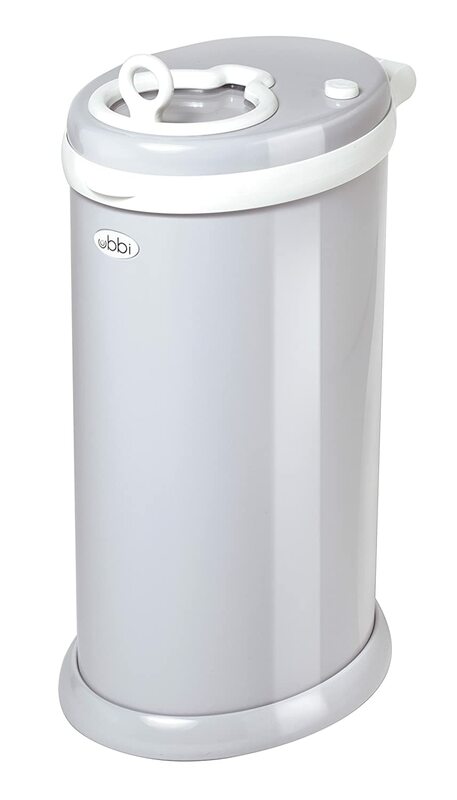 Ubbi’s pail design allows cloth bags to be used in the unit. Snap the bag into place, and you can wash it once a week when you empty the container. You’ll save money on bags and reduce your trash levels by reusing the cloth bag. One concern that’s been brought up among some consumers is possible product breakage. Within the steel, the container is a plastic section. This component locks onto the bag when you install it. Consumers report, however, that this plastic piece is breaking very quickly with heavy use. The hinge itself has a crack. You’ll need to maintain a gentle hand with this pail in regards to the plastic section. The Champ Deluxe by Baby Trend is a unique addition to the marketplace because it has a stylized appearance. With a smooth, white exterior and gray accents, you’ll be thrilled to place this pail in your nursery’s corner section. Most consumers have positive reviews on this product, which makes it a solid item to consider on your nursery checklist. An issue that’s a concern for some consumers is the plastic handle’s stability. Every time that you open the lid, the handle must be raised as well. If the lid is roughly handled, it can crack or break over time. Use a gentle motion as you access the pail’s interior. Don’t yank on the lid or slam it down. The pail can be used for several babies over the years when you treat the container with a gentle hand. Consumers love the fact that this brand has no assembly required. Whether you buy it online or at a storefront, the entire product will be in one piece. When most of the other nursery items are complex assembly projects, you’ll appreciate the ease with which this product falls right into place with the changing table. This is made out of plastic, so some odors might permeate the material. To combat these odors, consumers suggest using fresheners in the container. When you remove the bag, look down at the base of the pail. There’s enough space on the bottom for an air freshener. Use a disc filled with baking soda, and place it on the pail’s bottom surface. Add the bag to the unit too. Each time that you access the Baby Trend container afterward, you’ll have no odors or a pleasant, baking-soda aroma. At nearly 2-feet tall and 7 pounds in empty weight, this container is perfectly designed for a small nursery. You’ll mainly need enough clearance space above the pail in order for the lid to open with ease. It can also fit into a cabinet if necessary. In most cases, however, you’ll want to keep this container handy for all of life’s accidents. 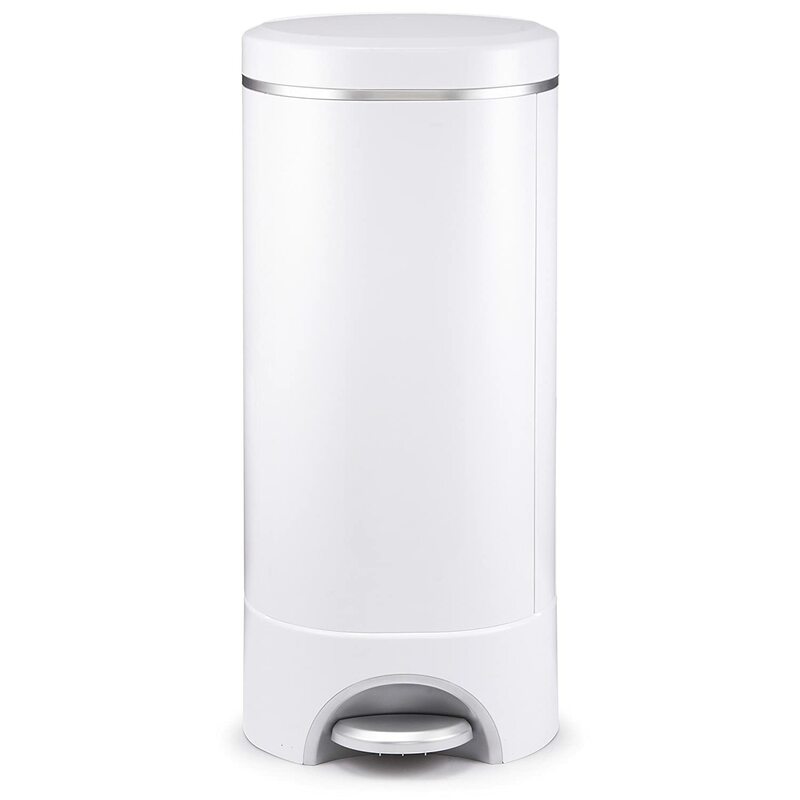 Parents who really need a budget on good diaper pail can rely on the Simplee product by Tommee Tippee. It’s essentially an all-white design with a decorative lid that comes in several color choices. This has both positive and negative reviews, but it’s an overall winner when you really want a dedicated, diaper-disposal system. Take a look at the features offered by this pail design. Your nursery will look complete with it standing tall in a corner. Some consumers state that the diaper pail container isn’t as handy as it appears to be. There is no foot pedal, which is often a standard feature on these pails. You must lift up the lid to access the interior space. Ideally, you must decide for yourself if the lid design will work for your household. Certain consumers find it frustrating while others have no issues with the construction. The online photos of this diaper pail can be deceptive. It may appear tall, but it’s only about 16 inches in height. 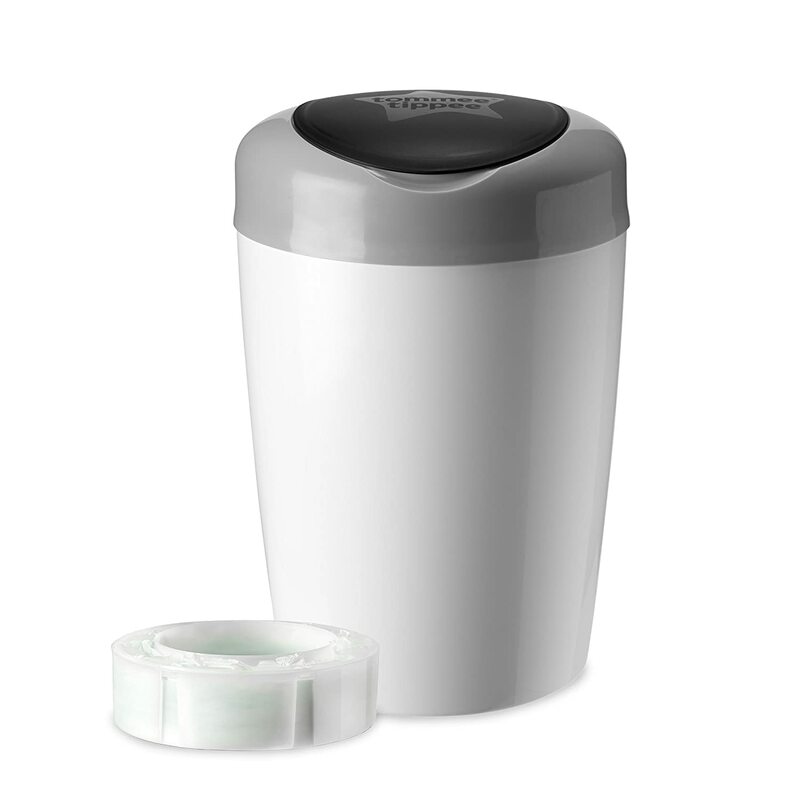 Tommee Tippee designed this pail so that it can fit into a cabinet with ease. You might want to hide the diaper pail when a company is over, especially if you want to give them a tour of the nursery. Its height makes it versatile with your decor options, but it won’t have the capacity of other models. Consider your baby’s needs before you buy this relatively small container. The top consideration for any diaper-storage container is odor control. New parents don’t have time to empty the diaper pail after each diaper change, but they also don’t want a pungent odor around the baby either. Select a product that has a sturdy construction. The connection points around the diaper pail should be welded and sealed as well as possible. Each access point must have gaskets that will help with fume control too. High-quality products usually have a filter that’s replaceable. Be diligent about changing the filter whenever possible, and your pail will always be fresh and ready for use. The trend of diaper pails in the past was using proprietary bags or liners. Manufacturers promised consumers that these quality liners would stop nearly every odor imaginable. However, the marketplace is a competitive world. To compete with all of the newest products, pail manufacturers are leaning toward universal liners. Select a pail that can hold a variety of different bags, including basic garbage types. If you ever run out of liners, another bag will perform just as well. You’ll also save money on the bags over time. Keep in mind that you might notice more of an odor issue when you don’t use the recommended liners, however. Your first inclination during the research process for the best diaper pail might be size consideration. No one wants to add extra chores to their day, so a huge diaper container sounds like a reasonable request. However, you don’t necessarily need the biggest product on the market. After only two or three days, opening the container might be difficult on the nose. A pail that holds a week’s worth of diapers may not be the best choice in this scenario. Ideally, pick a product that holds at least one day. It should be compact enough where it doesn’t take over the entire nursery floor. In the end, you’ll want to empty the pail on a regular basis for the health of everyone in the house. Every diaper-storage device is a tool for the parents. It’s filled, emptied and cleaned on a regular basis. Your chosen product must be easy to maintain, however. The interior liners should simply slide out when necessary with a simple mechanism for releasing the captured diapers. A cutting tool is a valuable accessory inside of the pail in order to remove the sealed diapers from the area. Ideally, you never want to expose the diapers to the air after they’re added to the container. Regardless of your chosen diaper container, always select a model that has a child-resistant lid. You want the pail to be easy for mom and dad to open, but not for your toddler running around the room. The lid should lock into place after each use. Parents and other caregivers must be diligent about closing the pail too. Allowing the pail to overflow might tempt children to explore the container, which can be harmful to their health. With responsible parents and a sturdy pail design, changing diapers will be no more than a loving exchange between baby and you. A quality container will always hide those offensive odors.